NARVACAN, Philippines - At least four people were killed after Super Typhoon Haima smashed into the northern Philippines with ferocious wind and rains, flooding towns and forcing thousands to flee although it slightly weakened Thursday after slamming into a mountain range on its way to the South China Sea, officials said. Haima’s blinding winds and rain had rekindled fears and memories from the catastrophe wrought by Typhoon Haiyan in 2013, but there were no immediate reports of any major damage amid spotty communications and power outages in several provinces. The typhoon slammed into shore in Cagayan province late Wendesday, and lashed the mountainous province of Apayao at dawn with slightly weaker sustained winds of 127 miles per hour and gusts of 176 mph. It was blowing northwestward at 15 mph toward the tobacco-growing Ilocos Norte, the last province before it exits toward the South China Sea, according to forecasters. In Narvacan town in northern Ilocos Sur province, ricefields resembled a brown lake under waist-high floodwaters. Despite the still-strong wind and rain, government workers have started clearing roads blocked with toppled trees and all kinds of debris. “We can’t go out because the wind is so intense, trees are being forced down,” Councilor Elisa Arugay told DZMM radio late Wednesday from Camasi village in Cagayan province. The government’s weather agency lowered it storm warning to level five, down from the highest level of six. 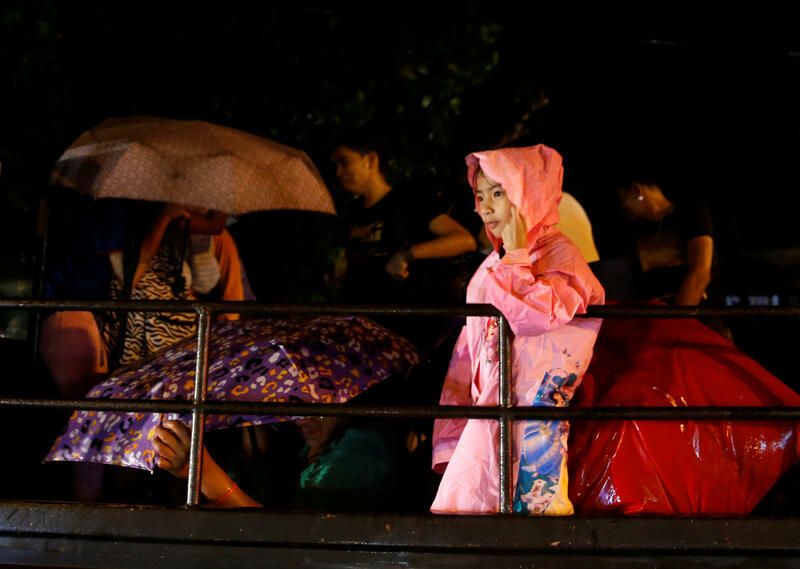 Philippine President Rodrigo Duterte, on an official visit to China, urged people in the typhoon’s path to heed orders by disaster agencies, including abandoning coastal communities prone to storm surges. Duterte is on a state visit to China and is to fly home Friday. In November 2013, Typhoon Haiyan struck the central Philippines with ferocious power, leaving more than 7,300 people dead and displacing more than 5 million others after leveling entire villages.